[119 Pages Report] The government cloud market size was valued at 14.10 Billion in 2016 and is expected to grow at a Compound Annual Growth Rate (CAGR) of 13.4% during the forecast period. Factors such as growth in the digital content across government entities, easier access from remote end-points, and need for regulatory compliances are fueling the growth of the market of government cloud across the globe. The base year considered for this study is 2016 and the forecast period considered is 2017–2022. The government cloud ecosystem comprises service providers such as Amazon Web Services (Washington, US), Microsoft (Washington, US), IBM (New York, US), Google (California, US), HPE (California, US), Oracle (California, US), Salesforce (California, US), Cisco Systems (California, US), Dell Technologies (Texas, US), VMware (California, US), Verizon (New York, US), CGI Group (Montreal, Canada), AT&T (Texas, US), SAP (Walldorf, Germany), NetApp (California, US), Informatica (California, US), Huddle (London, UK), Capgemini (Paris, France), CenturyLink (Louisiana, US), Citrix (Florida, US), Equinix (California, US), Fujitsu (Tokyo, Japan), NTT DATA (Tokyo, Japan), Red Hat (North Carolina, US), and NEC (Tokyo, Japan). Other stakeholders of the government cloud market include government vendors, cloud brokers, and managed service providers. These Government Cloud Software Vendors are rated and listed by us on the basis of product quality, reliability, and their business strategy. Please visit 360Quadrants to see the vendor listing of Government Cloud Software. 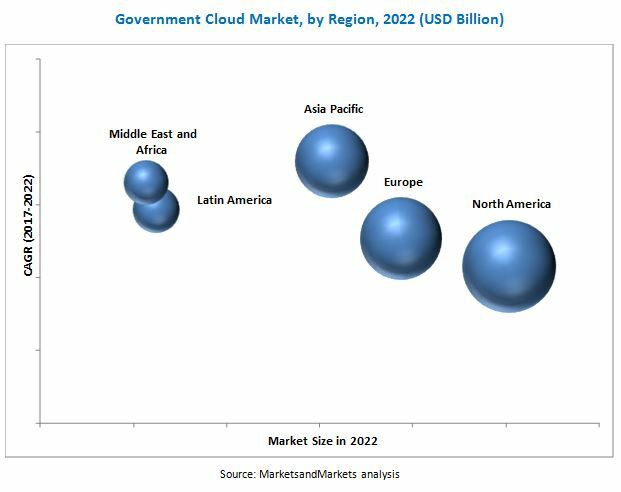 The government cloud market size is expected to grow from USD 15.40 Billion in 2017 to USD 28.85 Billion by 2022, at a Compound Annual Growth Rate (CAGR) of 13.4% during the forecast period. The major drivers of this market include low IT costs, availability of compliant solutions, minimized human dependence, protection of enterprise data against disasters, and need for regulatory compliances. The government cloud market report has been broadly classified on the basis of solutions into cloud storage, disaster recovery, Identity and Access Management (IAM), risk and compliance management, and others (reporting and analytics, and security and vulnerability management); on the basis of services into training, consulting, and education; support and maintenance; and integration and migration; on the basis of deployment models into public cloud, private cloud, and hybrid cloud; on the basis of service models into Infrastructure as a Service (IaaS), Platform as a Service (PaaS), and Software as a Service (SaaS); and on the basis of regions into North America, Europe, Asia Pacific (APAC), Middle East and Africa (MEA), and Latin America. The cloud storage solution is projected to hold the largest market size in government cloud industry and is expected to continue its dominance during the forecast period. The enormous amount of data that the local, national, and international governmental bodies and the associated agencies handle creates the need for a robust, secure, and cost-efficient storage infrastructure. The major factors driving the cloud storage include reduced cost of data storage, increasing demand for hybrid cloud storage, instant access and mobility, and easy deployment of cloud storage solutions. The training, consulting, and education services segment is expected to hold the largest government cloud market size during the forecast period. The major factors responsible for the largest size are higher Return on Investment (RoI) on software implementation, rapid deployment of technologies, increased efficiency in operational processes, and reduced workload on IT personnel. Moreover, these services play an important role, while implementing government cloud solutions, by assisting in selecting the most suitable solutions and services, depending on the requirement of the government organizations and end-users. The public cloud deployment model is estimated to hold the largest government cloud market share in 2017 and is expected to grow at a significant rate during the forecast period. The main reason for the high adoption of public cloud is its ease to access and fast deployment. The public cloud deployment model offers various benefits to the enterprises, such as scalability, reliability, flexibility, and remote location access. The public cloud deployment model is more preferred by the enterprises that have less regulatory hurdles and are willing to outsource their storage facilities either fully or partially. The major concern with public cloud is its data security due to which, many enterprises are shifting to private and hybrid cloud storage solutions. APAC is expected to be growing at a higher rate during the forecast period. The increased ICT spending in government infrastructure and government cloud initiatives, and the need to improve citizen services are some of the factors that have contributed to the growth of government cloud solutions in the APAC region. Moreover, the adoption of government cloud has increased due to the rising need for implementing security, accessibility controls, and enhanced decision-making. This has led the APAC region to become a highly potential market.